Who carries the risk? Asset-allocation challenges for defined-benefit pension schemes and their sponsors on the road to buyout. Are falling prices a risk to pension schemes? 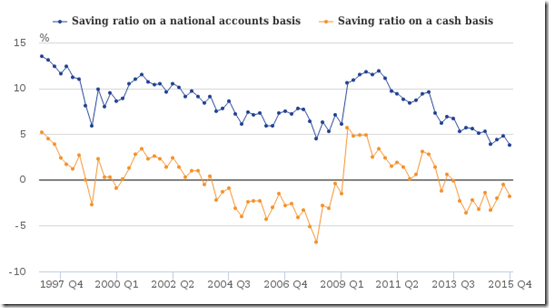 Three Charts on Secular Stagnation (Paul Krugman) – I think the interest rate chart is particularly important. “Nationally, renters are spending more of their income on rent than they have at any point in the past 30 years. Historically in the United States, the median household would need to spend 24.9 percent of their income to afford the rent on the median property. Currently that number stands at 29.6 percent. In some parts of the country such as Los Angeles, Miami and San Francisco, the average household would need to spend over 40 percent of their income to rent the average home. The capex call (FT Alphaville) – an interesting summary of CAPEX relevant data. Further Multiple Expansion Possible (Horan) – I would not personally rely on expectations of multiple expansion though. Economic consequences of income inequality (Michael Pettis) – As a fellow protagonist of the “income inequality is dangerous” argument, this is a worthwhile read. I was interested, in particular, in the historical comments by Marriner Eccles. The backdrop to the great depression may well have been an overvalued stock market, but like now, rising inequality probably had a much bigger part to play than many have alluded to. Blogs review: Does economic growth have a future in the United States? | Read more at Bruegel – a must read. IMHO: low growth dynamics are being ignored in market valuation risk assessment. Well done Food Babe – http://foodbabe.com/subway/ – and sign the petition! Intellectual Dishonesty at the Ivey Business Journal (Progressive Economics Forum) – hat tip Joe Killoran. Expectations For The Market In 2014 & No BuyBack’ Companies In The S&P 500 Index(Horan Capital) – some interesting charts. Have you noticed- Equities are the new bonds (FT Alphaville) – actually, yes, for quite a while…..
Canaccord to pay over $1-million to settle claims of inadequate supervision of retail accounts (National Post). Reflections is a monthly publication written by John Gilbert, CIO, GR–NEAM (hat tip Zero hedge) – some nice graphs here. Biggest drop in savings for 40 years, Bank of England figures reveal (Telegraph) – one of the weaknesses of the current economic and financial system is that it is dependent on consumption expenditure and population growth for its viability. A lot of this risk is to do with leverage (debt) and the importance of asset prices for future consumption and financial system stability. It should have been no surprise that as the economics started to unwind in 2007 that it passed directly through the banking system. High levels of debt, elevated asset prices, weak economic growth and deteriorating demographics means that the risks to the system remain elevated. 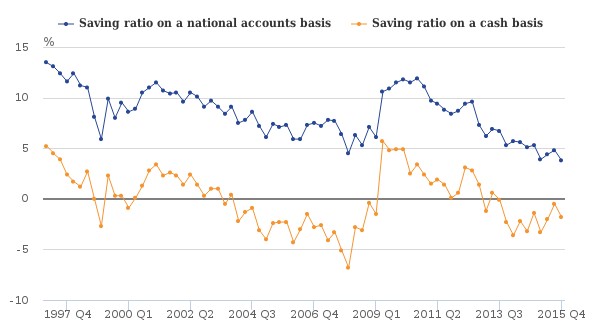 Growth that depends on higher levels of debt and/or reduced levels of savings is ultimately destabilising. OECD educational report: Pisa fever is causing east Asia’s demographic collapse (Telegraph) – and demographics…..
Regulators stumbling on many fronts (hat tip Ken Kivenko – Investment Executive) – there are far too many books on how to DIY finance but no books on “the behind the scenes” at the world’s regulators. I would be interested in such a book! BoE scraps Funding for Lending for mortgages to cool housing market (Telegraph) – Whether or not fortune will favour Carney or not is not the point: he has always seemed (to me) to be able to spot a problem in its appropriate context ahead of time, or at least before the crash. And if we switch to Canada, we have much the same problem in terms of capital misallocation, a point recently made by the IMF, and government support of the housing sector in Canada should take note. I feel that Carney is much more in his element in a UK framework, that is in a non sclerotic regime where the political will is actionable within a relevant time frame. When are markets “rational”? (China Financial Markets) – I would agree, but at the back of my mind I also think that asset focussed portfolio demand for assets as opposed to cash tends to be back-loaded, for a number of reasons, towards the end of the economic and market cycle. It is not so much that the balance of investors change, but the balance of allocation (stock) and flows change, and we only need marginal changes in the demand for cash relative to other assets and/or consumption to see large price swings in risky assets. I think QE also boosts this aspect of portfolio dynamics, which is a large negative. Market Advance Below Average In Return And Duration (Horan) – I would hate to base a valuation argument on the relative duration of the present bull market versus past ones. Underlying excess economic capacity (and hence potential non inflationary growth) is also reflective of the still significant structural domestic and global economic imbalances. I think markets are way above levels that you would need to accommodate risk going forward given these imbalances. In a long term growth story short term deviations from value, even significant ones, are not cataclysmic events, but I fear that this is not the paradigm. While moderate asset price increases in a low inflation, low interest economy with low growth would suggest a longer than average total upward trend, I would tend to argue that we have increasing instability – i.e. we have an accelerating and unstable equilibrium framework. In the event of a shock we would more likely get a move away from the trend than a re-establishment of it, which is something we had with most post war market movements. Sounds a bit like the retail promotion of financial leverage to consumers – the industry earns the commission but when the bets go badly the client suffers and there is little concern for the potential risks to the client (in this case the economy) when things go wrong. Often seen as remote, its leadership is now canvassing the views of ordinary Catholics on hot-button issues such as contraception and gay marriage. Reform has come on the back of scandal. What is the difference between reform of Canada’s retail financial services market place and the reform of the Catholic church? Not a lot it would seem: both seem to be initiated on the back of scandal, but at least the Catholic church now has palpable leadership. During the 1980s and 1990s, the labour-rights index fell precipitously (see the blue line below). The authors reckon this is down to competition for foreign direct investment. Jeremy Siegel: Stocks Are the Most Stable Asset Class in the Long Run (CFA Institute Blog) – I would refer readers to John Hussman’s weekly commentaries. Adjusting for data in the BEA accounts ignores the fact that profit margins are well above average, and I would also question why adjustment has also not been made for structural economic imbalances. Besides, trailing historic P/Es are also in over valued territory (my opinion). The five charts that explain business investment (FT’s Money Supply) – it is an area I have been meaning to review but have been sidelined on the topic of investment leverage. That said, one of the problems with GDP is that it is overly focussed at any one point in time on expenditure, as opposed to investment, and investment expenditure is key to both growth and expectations of growth. Weak investment with strong household consumption and recovery in asset focussed expenditure components, while welcome in part, do not dispense with concerns over long term growth rates. Weak investment, and the unrecorded depreciation of capital imply a mismatch between current market levels and the growth rate of cash flow. It is also, on a long term basis, a latent inflationary risk. Rakoff on financial crisis prosecutions (Prof. Jayanth R. Varma’s Financial Markets Blog) – a worthy read! The Market Hits All-Time High. So What? (Alliance Bernstein) – If I get a chance I might try and follow this up. As the article states, an all time high is not necessarily relevant unless valuation is, but I would hesitate to suggest that P/Es are not in towering territory given that a large chunk of the late 1990s have skewed this data considerably. 18.7 times trailing earnings is high, though not necessarily in the context of a pure relative numbers game. I think the market context is much deeper and broader. I always feel a bit of vertigo when I see the monte carlo defense though, as it all depends on the mean inputs and the standard deviations. If the expected average outcome is a good one people are not going to pay much attention to low probability low return events. Ken Kivenko’s 1 December Observer – an omnibus of issues concerning investor rights and abuse in the Canadian financial services industry. Investment advisers must earn their keep (National Post) Well worth a read and a possible reason for Ed Waitzer’s comments in today’s paper! I would qualify the 2008/2009 crisis differently as this was a rift that ran throughout the financial system (from regulators, to central banks, to governments, to financial institutions and to, a lesser extent, to investment advisors), although portfolios constructed in clients’ best interests would have been better prepared for the risks – lower costs, more appropriate structure, limited leverage and better representation of the risks. Investment advisors would not have been able to prevent the crisis itself, and would certainly have needed much greater support in valuation and risk to have been better able to negotiate it, but the attitude towards investors, and practises employed, certainly contributed to the fall out and distress. I agree with the Pope, in a big way, but it is not capitalism per se rather mankind that we have to fear. Capitalism is just a functional dynamic that allocates resources, and if it was able to function properly would prevent the vast inequalities that we see. I do agree that we need to emphasise humanity in our dealings but the issue is control: whatever system we have collapses to who or what is in control; power corrupts and capitalism itself has become corrupted by the control of an increasingly narrow group of self interests. Capitalism in its current form with its vast structural imbalances is a grave risk to the world we live in. All natural physical constructs have a base, but what has happened is that the importance of the base towards the physical integrity of the construct has been ignored. We need to rethink how our society is meant to work and for whom, but we still need a machine: there are too many of us and the logistics of anarchy are insane. Campaigners attack profits made by supermarkets from bag of cashews (The Guardian). Tolstoy addressed a similar plight of the Russian serfs in War & Peace through Pierre Bezukhov. Consumers own experience with the production of food is incorrectly sanitized. This is actually a good article in the sense that it is attempting to look more deeply at the issues and place some questions in the reader’s mind. Some thought has been applied over and above the need to meet the deadline! Shake up the investment industry (National Post – Tom Bradley Steadyhand Investment Funds).